Nobody likes being sick, especially when you’re so sick it means you have to spend lengthy periods of time confined to a hospital bed. Even more so, can you imagine being a child in that situation? It must be truly awful for them. Luckily for the kids at Indiana Children’s Hospital, they have Jason Haney, aka the coolest construction worker ever, to help put a smile on their faces. How does he do it, you may be wondering? 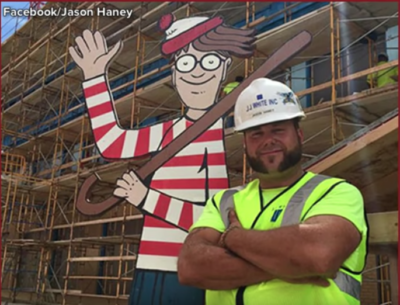 Well, you see, Jason Haney is the only one who knows the answer to one of the most important questions of our time; Where’s Waldo? 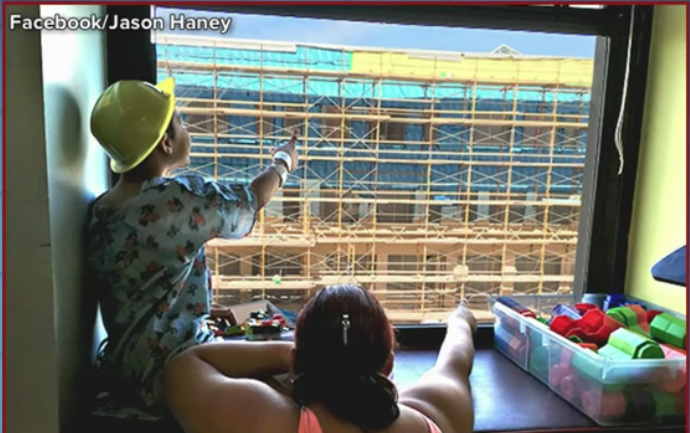 Allow me to explain; Haney, 41, was part of the construction team who were brought in to work on the new wing of Memorial Children’s Hospital of Bend. 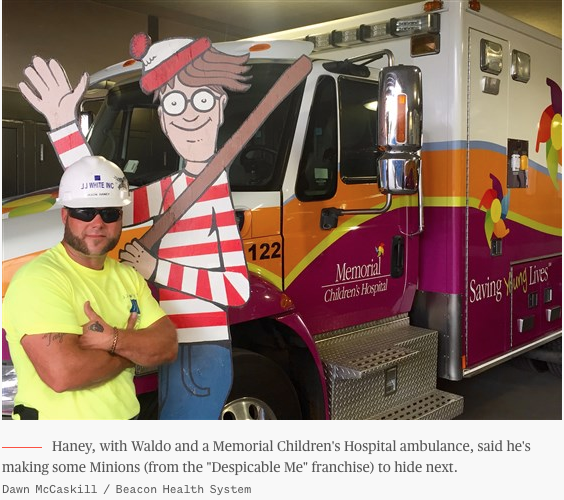 During this time, he decided to enlist the help of the ever so famously elusive character (aka, Waldo) in order to have some fun with the young patients currently in residence there. And how exactly does he help Haney does this? Well, every few days Haney hides an 8-foot cutout of Waldo around different parts of the unfinished building he’s working on, then challenges the kids of the hospital to try and spot Waldo from their windows next door. So. CUTE! “I can’t believe a simple piece of wood can bring so much happiness,” Haney told TODAY. 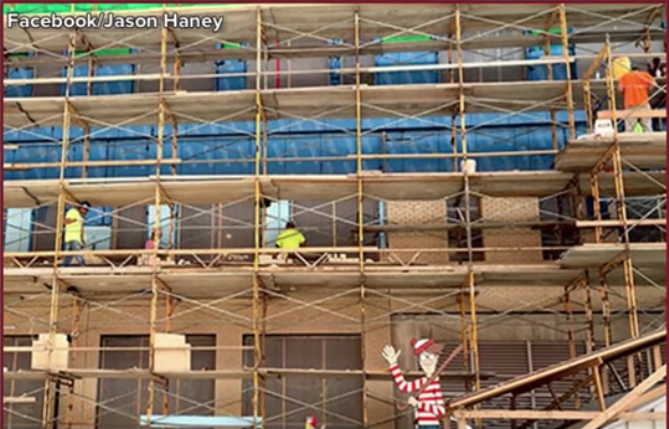 A spokeswoman from the hospital, Heidi Prescott, today TODAY that any updates on Waldo’s movements will send the kids scrambling to be the one who spots him first. 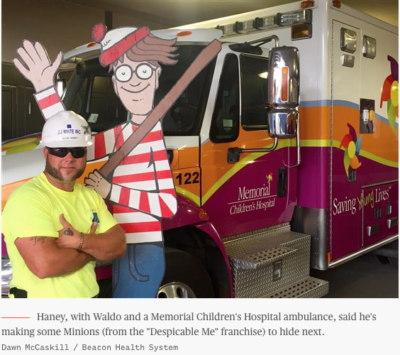 “You walk into the pediatrics unit and you ask the kids, ‘Where’s Waldo?’, and we have seen children in the play area or their rooms run up to the window and look out,” Prescott said. Haney actually first started this fun project during the winter when he built a snowman across the way from the hospital, which he then put a hardhat and vest on. This turned out to be a MASSIVE hit with the children, and the rest, as they say, is history. Later on, after the snowman, he then put up an inflatable snowman and a SpongeBob SquarePants figure in order to continue on with the fun. 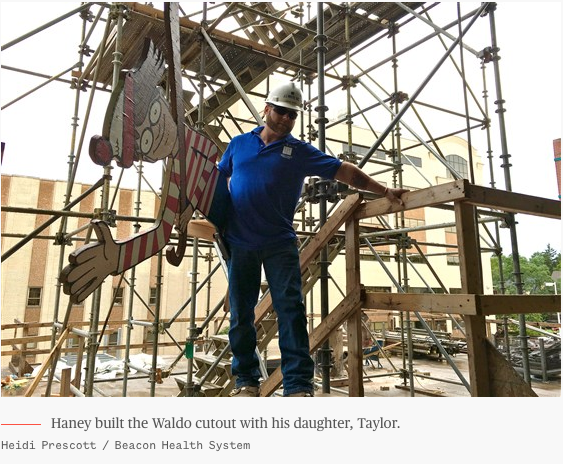 When he finally got the idea for Waldo, he took an ordinary 8 x 4 sheet of plywood and cut it perfectly into the shape of the beloved character himself, with the help of his daughter. He then also created a Facebook page where kids and their parents are able to post photos of Waldo once they spot him. How cool is that!? Haney and his wife, Heather, actually have a lot of empathy for the children who are currently in the hospital, as well as, of course, their parents. This is because they’ve been through a similar struggle themselves. Haney’s daughter, Taylor, suffered a stroke while in utero. In consequence, when Taylor was 3, the doctors told her parents that the damage caused by the stroke on the left side of her brain would prevent her from being able to learn past a third-grade level. Despite the doctors’ initial warnings, at the age of 18, Taylor graduated high school with honors and became a freshman at Ball State University the following fall. The brain truly IS an amazing thing! You go, Taylor! 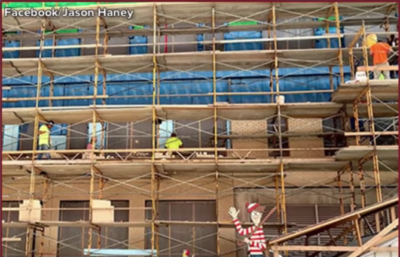 As for Waldo, the closer the wing became to being completed, the fewer spots there became for Haney to hide him. This did not deter him, however. Once it was no longer viable to hide 8-foot Waldo, in order to keep the game going he switched to other smaller, yet just as beloved characters…. the Minions! “We’re doing Minions next because they’re smaller,” Haney said. “The other day a girl who is about 10 years old was getting chemo, and you could just see her eyes light up when she met Jason,” Prescott said. What a fantastically selfless thing to do for all those children. It just goes to show that no matter who you are or what you do, you can always find a way to put a smile on somebodies face! Great work Jason and team!